Q: It is reported that Chinese officials held talks with leaders of four armed groups of northern Myanmar a few days ago. Could you confirm and share relevant information? Does the Myanmar government agree with such talks? A: The situation in Myanmar concerns peace and tranquility of China-Myanmar borders, and the conflicts in Kokang have severely impacted security of border areas in China. We demand that relevant sides in Myanmar immediately stop fighting, prevent the situation from worsening and restore normal order to the border areas as quickly as possible. We call on all relevant sides once again to address differences through dialogue and consultation peacefully. China respects sovereignty, independence and territorial integrity of Myanmar and supports the peace process in Myanmar. In accordance with the aspiration of the Myanmar side, China has played a constructive role in promoting peace and talks in the peace process. After the outbreak of conflicts in Kokang, China has done a lot through existing channels, including the engagement of the Foreign Ministry's Special Envoy for Asian Affairs with relevant parties in Myanmar. This is aimed at stabilizing the situation as quickly as possible and maintainning peace and stability in China-Myanmar border areas. Q: The New York Times carried a series of articles these days, telling the public with details and statistics that the issue of nuclear waste is yet to be resolved six years after the Fukushima earthquake. CCTV's evening gala for the consumer rights day yesterday also exposed the entry of food from nuclear contaminated areas of Japan to the Chinese market. How do you view this? A: With regard to the entry of food produced in nuclear contaminated areas of Japan to the Chinese market as was exposed at yesterday's "March 15" evening gala, I believe competent Chinese authorities for food inspection and quarantine will handle it in accordance with the law to ensure food safety and protect people's health. We have been following the Fukushima nuclear leakage incident and its follow-up impact. We have also noted commentaries issued by the Japanese media on the occasion of the sixth anniversary of the leakage, saying that the Japanese government fell short of effective measures in treating nuclear contaminated water, earth and radioactive waste. Their discharge of nuclear contaminated water into the sea posed a looming threat to the marine environment and people's health. The Japanese government was also slow in adopting corresponding measures, lacked information transparency and failed to convince the public with statistics on food safety. What I want to say is that the Fukushima nuclear leakage and issues that emerged in the handling of it have a direct bearing on not only the safety of Japanese nationals, but also that of China and other countries in the region. It is regrettable that the Japanese government has been either mute or evasive about the leakage over the past six years, and is yet to assuage the concerns shared by people in and outside Japan. We once again urge the Japanese government to be responsible with the common interests of the international community, fulfill their international obligations, release accurate and reliable information in a timely fashion and avoid doing anything that is detrimental to marine environment and people's health. Follow-up: Will the Chinese Foreign Ministry issue a travel alert? A: The safety alert issued by the Foreign Ministry in 2011 remains valid. It is hoped that Chinese citizens will make proper plans on their trips and ensure their own safety. Q: The Japanese Self Defence Force is going to send its largest destroyer to the South China Sea and the Indian Ocean for joint military exercises. Comments say that this is a move taken by Japan to increase its military involvement in the South China Sea, in support of other South China Sea claimants. What is China's comment on that? A: Since last year, under the concerted efforts of China and ASEAN countries, the situation in the South China Sea has been getting better. 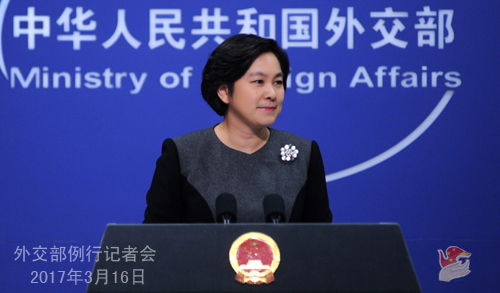 Relevant countries outside the region should respect our efforts in safeguarding peace and stability of the South China Sea. Out of its selfish interests, Japan has been stirring up troubles and creating splits in the South China Sea. Their behavior has prompted dissatisfaction and opposition of the Chinese people. If the Japanese side insists on doing so, or even attempts to get militarily involved in the South China Sea, harm China's sovereignty and security, and heighten regional tensions, the Chinese side will definitely take firm actions in response. I want to remind the Japanese side that they are not a party concerned in the South China Sea issue, and that they have a disgraceful history of occupying China's Xisha and Nansha Islands during its war of aggression against China. The Japanese side should reflect upon the history, and be discreet with its words and deeds, instead of making waves in the South China Sea and impairing regional peace and stability. Q: US Secretary of State Rex Tillerson will visit China this weekend. What will be discussed by the two sides? Will the Korean nuclear issue be one of the topics? What kind of message will China send to the US? A: At the invitation of Foreign Minister Wang Yi, Secretary of State Tillerson will visit China on March 18 and 19. The two sides are communicating closely with each other about arrangements for relevant meetings and talks. There have been media reports saying that the issue of Korean Peninsula will be on the top of the agenda during Secretary Tillerson's visit. Recently, the Chinese side has expressed over and over again its concerns over the escalation of tension on the Korean Peninsula, and come up with the suspension-for-suspension proposal and the parallel-track approach, with the aim of getting the Peninsula out of the security predicament, addressing all parties' concerns in a synchronized and reciprocal manner and realizing enduring peace and stability on the Peninsula. China's proposal hits the nail on the head, accommodates all parties' legitimate concerns and meets the requirements of relevant UN Security Council resolutions. It is rational, reasonable and impartial. We hope that all parties concerned will think seriously about it and make a constructive response. 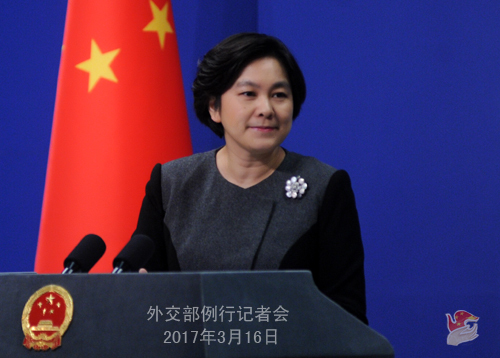 The Chinese side has been communicating with the US closely on the issue of Korean Peninsula. If anyone, the US side included, has an alternative proposal, as long as it is conducive to bringing down the tension, promoting peace and stability of the region and putting the Korean nuclear issue back on the right track of peaceful settlement through dialogue, we welcome that. Q: Philippine Senator Trillanes tabled a motion on March 15, seeking an investigation into President Duterte's decision of allowing Chinese research vessels to go to the Benham Rise. What is China's comment on that? 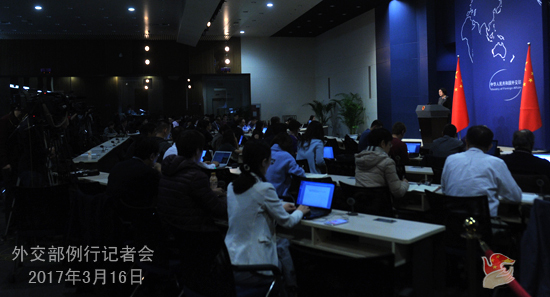 A: China has made its position clear on the relevant issue. It is regrettable that some individuals in the Philippines keep distorting the facts and misleading the public. I would like to stress once again that the Chinese side fully respects the Phillippines' rights over the continental shelf in the Benham Rise. There is no such thing of China challenging the Philippines' rights. At the end of last year, the relevant Chinese vessel for marine research did sail across waters to the northeast of Luzon, the Philippines. Chinese vessels are entitled to navigation freedom and innocent passage under UNCLOS and other international law. It is groundless to say that the Chinese vessel conducted operations or other activities in waters off the Benham Rise. Thanks to the concerted efforts of China and the Philippines, the bilateral relationship has been developing soundly with rapid progress in practical cooperation across the board. It serves the common interests of the two countries and two peoples, and meets the shared aspiration of a majority of peace-loving countries in the region and beyond. It is hoped that relevant individuals in the Philippines will work for the wellbeing of the country and the people and not create obstacles for the China-Philippines relationship. Q: Foreign Minister Wang Yi made the suspension-for-suspension offer last week, but the US insists that the DPRK should first take concrete steps to reduce their nuclear arsenals. Mr. Tillerson is the first member of the Trump administration to visit China, and the Korean nuclear issue will be front and center of bilateral talks during his visit. Given that President Xi Jinping is meeting President Trump soon, will China perhaps amend the proposal, in order to move the situation forward? A: The Korean nuclear issue has been lingering for many years. The US side insists that the DPRK drop its nuclear program first, while the DPRK demands that the US side stop its DPRK-targeted large-scale military exercises first. Neither is willing to take a step back. But just like what Foreign Minister Wang Yi said at his press conference during the two sessions, are they truly ready for a head-on collision? Everyone knows that to start the talks and reach compromise, both sides need to take a step back. China's suspension-for-suspension proposal accommodates the current legitimate security concerns of all sides and aims at resolving the security predicament on the Korean Peninsula as quickly as possible. This is impartial, rational and might be the only viable plan against the current circumstances. Of course, if the US side or any other sides have better approaches or ideas, they might as well put them forward. China has an open and constructive attitude towards all proposals that help ease the current tensions and bring all sides back to dialogue for the peaceful settlement of the Korean nuclear issue. The thing is whether other parties have such a proposal or not. Therefore, it is not about whether China is willing to revise the suspension-for-suspension proposal, but actually about whether all sides can truly bear in mind the larger interests of regional peace and stability, work for the proper settlement of the Korean nuclear issue and consider China's proposal seriously. Follow-up: I think the US believes that if they suspend the military exercises, that is quite easily verifiable. But if the DPRK says it is going to suspend part of its nuclear program. There is no way that anybody knows, including China, whether they have actually done this. How do you see that? A: The Korean nuclear issue is highly complex. Relevant parties, especially officials responsible for policies towards the DPRK, need to spend some time looking into the track record of the Korean nuclear issue. Previous efforts by members of the Six-Party Talks, including the US and the DPRK, have been effective in reaching the September 19 Joint Statement. The key is how to ensure that such a statement is well implemented and that all sides shoulder their due responsibilities and obligations. Take the UN Security Council resolutions as an example, while imposing sanctions is part of implementing the resolutions, promoting talks is also stipulated by the resolutions. We suggest that the DPRK suspend its nuclear and missile programs and that the US and the ROK suspend their large-scale military exercises against the DPRK. When tensions subside, necessary conditions are in place for parties to sit down and negotiate. On that basis, the two sides can address their respective legitimate concerns in a synchronized and reciprocal manner and work out a plan for the enduring stability and tranquility on the Korean Peninsula. We hope that all parties can bear in mind the larger interests of regional peace and stability and consider China's proposal seriously. Q: There have been a lot of reports about Japan's Moritomo Gakuen brainwashing children with right-wing education and pre-war practices. Children were taught to sing military songs, and recite the 1890's Imperial Rescript on Education. Japanese Defence Minister Tomomi Inada said in an inquiry at the Diet that Japan should reclaim the core values of the Rescript. What is China's comment on that? A: It reveals once again that there are some elements in Japan who refuse to face up to and reflect upon the history, deny their guilt in waging the war of aggression, and even attempt to reverse the verdict on history and renew militarism. These elements blatantly infuse the younger generation with militarism thought through education institutions. People of vision from Japan and other countries in the world should be on high alert for that. What I want to stress is that the war of aggression launched by the Japanese militarism in modern times has brought horrendous suffering to the people of its Asian neighbors and other victimized countries. The Japanese rulers should take history as a mirror, draw lessons from history and make a clean break with the past of aggression, rather than connive at the right-wing educating the younger generation with a wrong outlook on history. Q: The King of Saudi Arabia is currently on a state visit to China. Is there anything you can share with us about the visit. What details on meetings and agreements can you give us? A: President Xi Jinping held talks with King Salman this morning. We will release official information very soon. Also, may I suggest that you take a look at the recent written interview that Foreign Minister Wang Yi has given to Asharq Al-Awsat of Saudi Arabia, where he elaborated on China-Saudi Arabia relations, the significance of King Salman's visit to China and cooperation between the two countries on the Belt and Road Initiative and Middle East affairs. I believe you will find it informative.